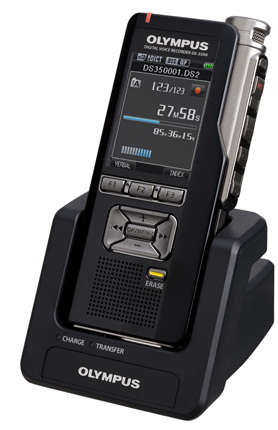 This sleek, compact recorder offers intuitive controls that are easily managed and completely mobile. With a 5-Star Dragon Accuracy Score in addition to enhanced security features, the DS-3500 is the ideal choice for professionals who need to produce highly accurate and confidential information. The Olympus DS-3500 offers a number of high-end features that allow it to deliver a superior recording experience. If your business cares about keeping information confidential, the DS-3500 is a compelling and convenient choice. A separately housed microphone with easily accessible control panel creates precise recording ability, but it is the voice-activated recording option that is most impressive. Called, VCVA, the voice-activated feature ensures that recording takes place only when people are speaking. Recording stops when things go silent thereby saving memory space and ultimately streamlining the playback and transcription process. You can also record memos at the same time that your recording or simply set up to 32 index points for easier navigation during playback. The Olympus DS-3500 is simple to use and incredibly reliable with up to 26 hours of recording time. If you’re looking for accurate recording capabilities, security and an overall easy process, the Olympus DS-3500 will get the job done.